As we said goodbye to Gary Maciag, OFM, and concluded our Proclaiming the Word workshop Friday, we were immediately greeted by Gabriel Scarfia, OFM, to begin yet another one on Saturday. Starting that night and ending this morning, the postulants squeezed in six highly intensive sessions with Gabe in an attempt to grasp the significance of the Second Vatican council within the scope of Church history and to understand its relevance today. For those of you that know anything about the council, this was no easy task. 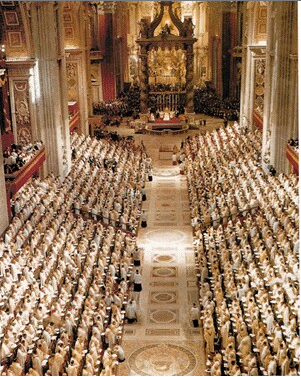 A fully realized post-Vatican II world would be one where the laity acknowledges itself as (and is treated like) the centerpiece of the Christian experience, with just as much responsibility for upholding the life of the Church as the priests and bishops; a world where vast disparities of wealth, power, freedom, and education were as disgusting and unacceptable as abortions, and the Christian faithful did not rest while they existed; a world where the Truth of the Gospel was celebrated with open and sincere hearts no matter where it was found, especially in non-Catholic religions and belief systems; and a world where we realized that by it’s very nature, the Church was missionary (Jesus was sent by God), sacramental (by gathering, we both visibly represent, and effectively bring about, the power of the Holy Spirit), and catholic (universal to all people, of all lands, at all times). Radical? Yes. Consistent with the Tradition of the Church instituted by Jesus? Absolutely. Something that we can live up to? I hope so. For most of you, I imagine, the Second Vatican council is not something that comes up very often in everyday conversation, and it may be a topic that you cannot articulate well, if at all. This, honestly, is a problem. If some of the things I mentioned about sound strange or intriguing, or if you just don’t believe me when I say they were spoken by the council, I strongly recommend that all of God’s faithful look deeply into the words of the council, either by looking at the most important original texts of Lumen Gentium and/or Gaudium et Spes, or by one of the many summaries found online. These things are not meant to be read only by priests, bishops, and friars in training like me! Everyone with an open mind and heart for Christ is compelled to take part in this council’s work, and to be sent forth to fulfill its mission! That’s what I’m working on. It’s good to read that Vatican II is still valued in some places. There seems to be so many people who want to roll the clock back to pre-Vatican II days. As one of my pastors told me many years ago, “They long for the good old days that never were.” How true. Casey & Emil, My sentiments EXACTLY! Keep that Franciscan Vatican II spirit alive–Something sorely missed since the friars left my my home parish. Nice to have an outlet to discuss this. Our diocesan priests can’t say anything (other than tow the line), as they have to answer to the Bishop.